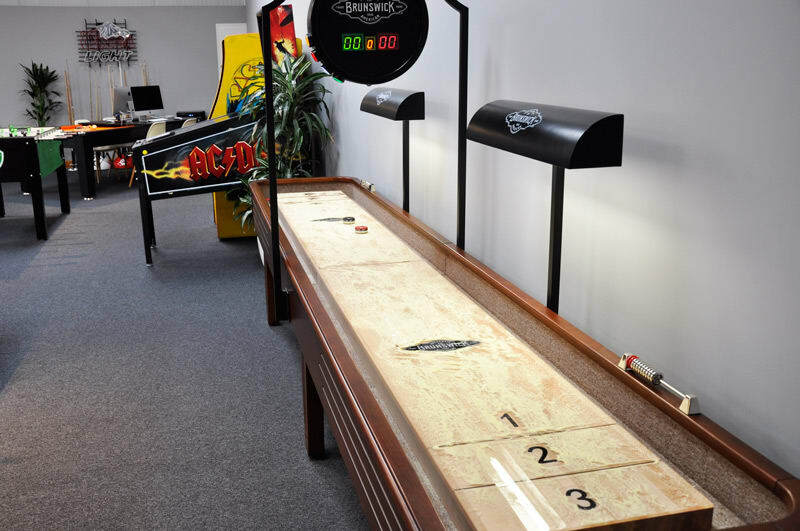 We're great fans of all things fun, which is why we now have a Brunswick Andover Shuffleboard in our showroom - a classic game dating back over hundreds of years. The game of shuffleboard has been tracked back over 500 years and was mostly played by Kings and Lords. The game was most famously played by the English king, King Henry V||, who banned ‘commoners’ from playing. He mostly played against Lords from England and used the game as a way of gambling. Shuffleboard used to be played on any wooden or concrete floor, the markings would be drawn out on the surface and would be 12 metres long, 1.8 metres wide. Each end of the court had a scoring triangle and players would use cues to push weighted disks along the shuffleboard to land in the scoring zone in order to score points. This scoring triangle would be divided up into numbered sections, the highest scoring player won. Now, there are table variations of this game which are similar to the shuffleboard on display in our showroom. The play area is commonly a wooden surface which is covered in sawdust or shuffleboard wax to avoid friction between the pucks and the table. In this variation of the original game, the pucks are propelled across the board using your hands. There are still scoring zones at each end of the table to rack up points through play. The aim of the game is to get more points than your opponent through sliding the pucks, bumping opposing pucks off of the score board and by protecting your own pucks from bump-offs. You start a two-person game by standing on the same end of the shuffleboard. You can toss a coin to decide who will shoot first and the colour of the puck. The first player then slides their first puck to the scoring end of the board. Both players should continue shooting alternately, until all eight pucks have been shuffled. Doing this completes one round of play. The player whose leading puck is furthest down the board, without falling of the edge, is the winner of that round. Their score is then totalled and registered on the scoreboard, the opponent’s score is not registered as they have lost the round. 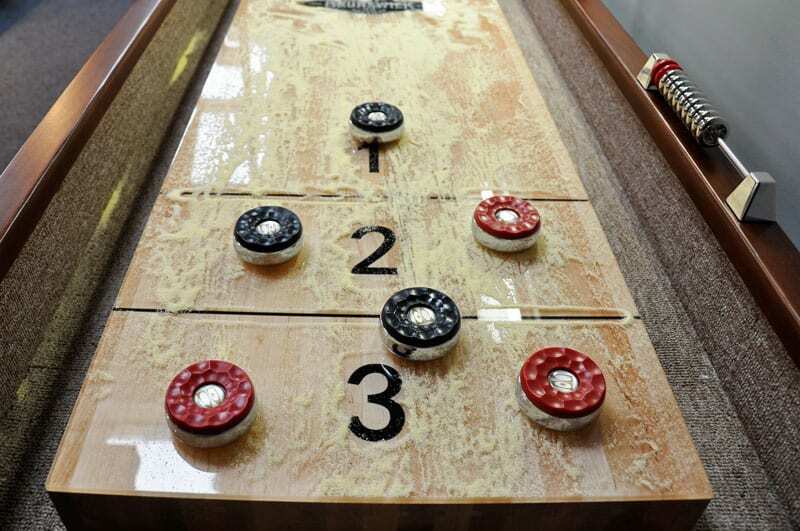 After each round, both players should change to the other end of the shuffleboard, where the pucks are now resting. With the winner of the previous round shooting first, play another round of shuffleboard in exactly the same manner as described above. The game continues until one player scores 15 points in total. That player has then won the game. With four players, split into teams of two players each. You have one player from each team at the opposite end of the board. Similarly to a two player game, you can toss a coin to determine who will shoot first and the colour of the pucks. Then each team should designate who will shoot the first round. These two players shoot their pucks alternately, until all eight pucks have been shuffled.The winner of the round is the team player whose puck is the furthest down the board. Their score is then totalled and registered on the scoreboard. The opponent’s score is not registered as they have lost the round. The team players at the opposite end of the board, where the pucks are now resting, clear the board and begin another round of play from their end – in exactly the same manner as the first round. The partner of the previous round’s winner shoots first. The game continues with as many rounds as necessary, until one team score a total of 21 points. Is Shuffleboard still popular today? The game is still popular all over the world, but mostly in America and England. American bars often house Shuffleboards as the centrepiece of the room for their customers to enjoy. It’s proven to be quite popular amongst punters due to the hands-on gameplay. The game is also becoming popular in England, especially in Norfolk where shuffleboard is played in tournaments. The Norfolk Area Shuffleboard Association was set up to organise leagues and events for the region. Why would I want a Shuffleboard? Playing shuffleboard is a great game for all of the family and your friends as it’s hands-on and unpredictable. It’s a completely different game to anything your guests may have ever played before , making it a new experience for all. The size of the tables can either be 12ft or 14ft long meaning it could probably fit into the garage or living room of the average family home. This classic shuffleboard table is fun for everyone, no matter what age as it’s simple to play. The shuffleboard table has a North American maple wood playfield and polymer resin surface, which makes this table smooth to play a great centrepiece for any room. It’s available in 12ft and 14ft sizes to suit the size of your room. The whole Brunswick range, including the shuffleboards, are exclusive to us at Home Leisure Direct and come with a lifetime guarantee from Brunswick themselves. It also comes with all the accessories you need to play on the table as soon as it is fitted, including four black pucks, four red pucks, a stainless abacus scorer, a table brush, and shuffleboard wax. There’s also an optional scorer and light sets available if you wish to have them. This shuffleboard is now in our brand new showroom, so feel free to come on over and have a go for yourself to truly get a feel for the game! 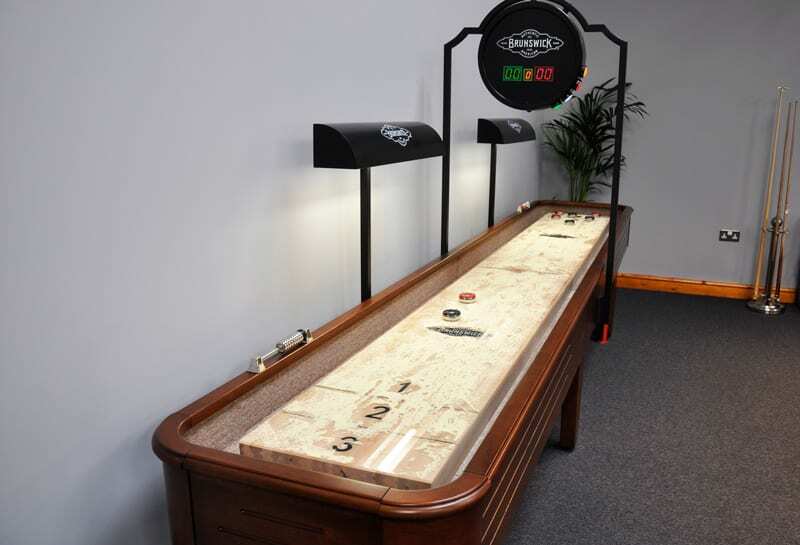 If you’re interested in the Brunswick Andover Shuffleboard or would like to add it to your games room, please don’t hesitate to contact us at Home Leisure Direct. You can call us for free on 0800 622 6464 or e-mail us on sales@homeleisuredirect.com to speak to a member of our expert sales team who will be able to answer any questions or queries that you may have.